Pour the broth into a large sauce pan and bring to a boil over high heat. Reduce to low and simmer. While the broth simmers, melt half of the butter (4 tablespoons) in a large, high-sided skillet over medium-high heat. Add in the sage leaves, and cook until the sage is fragrant and the butter begins to slightly brown, about 4 minutes. Add in the onions and garlic, and cook until they are fragrant and tender, about 3 minutes. Add in the rice, and stir so each grain of rice is coated by the butter mixture. Continue cooking the rice until it begins to brown slightly and smell toasty, about 3 minutes. Remove the pan from the heat and add in the white wine. Return the pan to the medium-high heat, and then use a spoon to scrape any browned bits from the bottom of the pan. Stir constantly while the rice absorbs the wine. Once the rice has absorbed most of the wine and the pan looks relatively dry, add one ladleful of the hot chicken or vegetable broth to the pan. Stir frequently until the liquid is absorbed and the pan again looks relatively dry, about 2 minutes. Repeat this process, adding broth one ladleful at a time and stirring until the liquid is absorbed, until only about 2 cups of broth are left. Begin tasting the risotto for doneness and seasoning when you have 2 cups of broth left. Depending on the age of your rice and the humidity in the air, you might not need all 8 cups of broth to get the rice soft and tender. Your rice should start to soften up around the 15-20 minute mark. When the risotto is tender and creamy, remove from heat. Season with salt and pepper to taste, and then stir in the remaining butter, Parmesan and pumpkin until cheese and butter are melted. Serve immediately topped with additional sage leaves and pepitas. At first, the rice will absorb the liquid rather quickly. As the rice becomes more tender, it will take longer and longer for each ladleful to be absorbed. Don’t walk away while you’re making risotto—it has a tendency to scorch quickly. Keep on stirring! Risotto should really be served immediately after cooking; as risotto rests, it becomes more starchy and thick. If this happens, just thin it out with a bit more broth. If you’re looking for a whole grain option, you can swap out arborio rice for farro, follow the same method, and get an equally creamy and delightful texture. Risotto isn’t actually complicated, but don’t bother telling that to your friends when you serve it. Creamy, cheesy, warm, pumpkin-y—THIS is how you do fall comfort food. The truth? Risotto gets a diva rep because you can’t just set-it-and-forget, but it isn’t actually complicated. To make a really great risotto, you gotta do some babysitting. But holy guacamole, it is WORTH IT. It’s always a good idea to have everything ready to go when cooking, but with risotto, it’s super important. Get all your vegetables chopped and make sure you have all the ingredients measured and ready to roll. First up, pour eight cups of Progresso™ Chicken or Vegetable Broth into a medium-size saucepan and heat it to a simmer over medium heat. Reduce heat to low and keep it simmering while you move on. Next up, pour in two cups of Arborio rice—that’s the kind of rice you use to make risotto, and you can nab it in the grain aisle at your supermarket—and stir, stir, stir until each grain of rice is coated with the buttery goodness. Keep stirring and cooking until the rice just begins to slightly brown and smell toasty. Turn off the heat (or remove the pan from the burner) and pour in half a cup of white wine. Return the pan to heat, and use a spoon to scrape up any yummy brown bits that were on the bottom of the pan. Keep stirring the rice until the wine is mostly absorbed. Once the wine is soaked in, take a ladle and add one ladleful of the hot broth to the pan. Stir the rice constantly until the broth is soaked in. It shouldn’t take too long, just a minute or two. Once that first ladleful is soaked up, add in another ladleful of broth, stir until it’s absorbed, and keep on keepin’ on with this pattern until you have about two cups of broth left to add. This should take 15-20 minutes. Depending on the age of your rice and the humidity in the air, you might need more or less broth to get the rice tender. The only way to know if it’s done? Taste it, baby! Grab yourself a spoon and keep tasting until it’s soft, tender and oh-so-creamy. 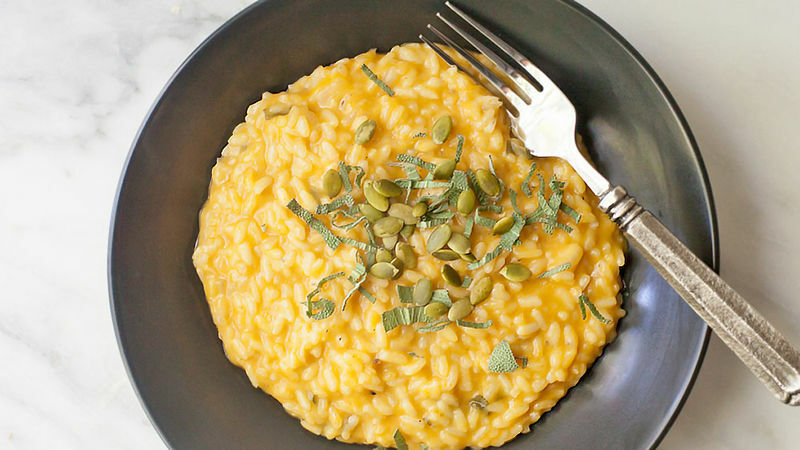 Once the risotto is creamy and tender, remove it from the heat. Stir in the remaining half stick of butter, a half cup of Parmesan and a full cup of pumpkin puree. Stir until it’s all melted. Serve immediately topped with more sage leaves and pepitas (if you like the crunch).